Jane Bockus is a trial lawyer. For 40 years, companies and their national counsel have counted on Jane's regional knowledge, experience and collaborative approach to complement their national strategies for litigation involving mass torts and claims of serious injuries. She has tried more than 30 cases to verdict in a variety of complex matters. Jane has also defended products liability cases involving automobiles, asbestos, road grading equipment, power tools and electronic appliances. She has also tried numerous professional malpractice and insurance bad faith cases. A team leader who has tried many cases to verdict, Jane develops the strategies and identifies and develops the expert witnesses critical to defending product manufacturers. Jane has developed her own style; she is engaging, friendly and disarming — so disarming that adverse witnesses let their guard down, and then in her very easygoing and charming way, Jane scores major points. Juries like her, and they can tell that she is genuine. Jane’s clients and team members appreciate her responsiveness, her understanding of regional and local differences as well as her ability to simplify complex scientific information in the creation of jury-friendly trial themes. While Jane has been successful in front of juries, her gusto and readiness for trial also produce results for clients at the settlement table. Jane was on the trial team for the first bellwether trial in the federal court MDL in a case involving five consolidated plaintiffs. Summary judgment was granted the day jury selection was to begin based on the learned intermediary doctrine. The ruling was confirmed by the Fifth Circuit. In Re Norplant Contraceptive Products Liability Lit., 165 F. 3rd374 (5th Cir. 1999). She was also on the trial teams for the first three Norplant cases tried in state court in Texas – all in traditionally plaintiff-friendly jurisdictions. The first case (in Edinburg) resulted in a mistrial (after one plaintiff’s lawyer accused another of suborning perjury), the second (in Brownsville) a defense verdict and the third (in Beaumont) a defense verdict for 3 of 4 plaintiffs. The verdict for the remaining plaintiff was reversed on appeal. Wyeth Ayerst v. Medrano, 28 S.W. 3rd 87 (Tex App. 2000). Jane was on the trial teams that tried the first two MDL cases to verdict in the hormone replacement litigation in Little Rock, Arkansas. Both trials resulted in defense verdicts. She was also on the teams that opposed three attempts to certify classes for “fear of harm” from use of HRT in Miami, Philadelphia and Little Rock. Those teams successfully defeated all attempts to certify a class. 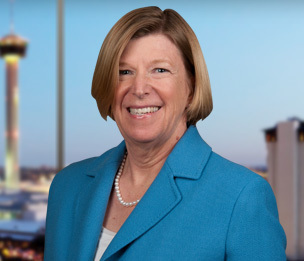 Jane has defended manufacturers of therapeutic beds, surgical instruments, optic lenses and pelvic mesh in both state and national mass tort litigation. Jane was on the trial team that tried five consolidated asbestos cases in federal court in Laredo, Texas. The trial resulted in a verdict that was a fraction of the amount that had been offered in settlement and the plaintiff asked for a new trial. The request was denied. Jane was on two trial teams defending a talc mining company in the City of St. Louis in which the plaintiffs claimed use of body powder caused their ovarian cancer. The jury in the first trial found that the mining company was 1% responsible for the plaintiff’s injury. The second trial resulted in a mistrial when a U.S. Supreme Court opinion was handed down during the trial which clearly established that the court did not have jurisdiction over the out-of-state plaintiffs. Jane has tried cases involving claims of defective design of motorboats, road construction equipment, and computer equipment. In addition, Jane has tried numerous medical malpractice cases and cases alleging violation of the Deceptive Trade Practices Act in state and federal court in Texas, Missouri and Arkansas. She has also represented insurance companies in high exposure bad-faith cases arising from catastrophic weather events, as well as coverage disputes and complaints against agents. Jane has proven that it’s possible to be an excellent attorney who focuses on winning trials while retaining a great sense of humor. In her spare time, she accomplishes feats outside of the courtroom such as competing in sprint triathlons and swimming from Alcatraz to San Francisco!